Hamas reaches agreement with other Gazan militias to avoid weekend flare-up in order to allow Egfyptian cease-fire initiative to suceed. 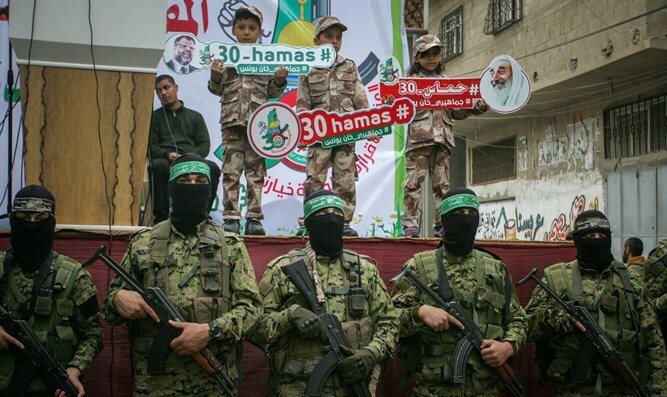 A source told Ynet that Hamas has reached an agreement with other Gaza-based terror groups to avoid a weekend flare-up with Israel. According to the report, the assorted Gazan militias agreed to avoid violence until Sunday in order to enable an Egyptian-brokered cease-fire to take effect. The agreement includes the cessation of incendiary balloons that have touched Israel over the previous six months. The “March of the Return” border riots have been ongoing every Friday since March 30, but in recent weeks have become more frequent. The violent demonstrations often deteriorate into full-scale riots, with demonstrators throwing grenades at IDF soldiers and burning tires. Last Friday, around 40 rockets were fired from the Gaza Strip towards Sderot and the communities surrounding the Gaza Strip. About 10 of the rockets were intercepted by Iron Dome. In response, the IDF attacked some 80 terrorist targets in the Gaza Strip, including a four-story building used by Hamas's security headquarters and a war tunnel. Israel and Gaza have been holding tenuous negotiations over the last few months whose aim is to broker a long-term lull in violence between the two sides in exchange for Gaza's rehabilitation.